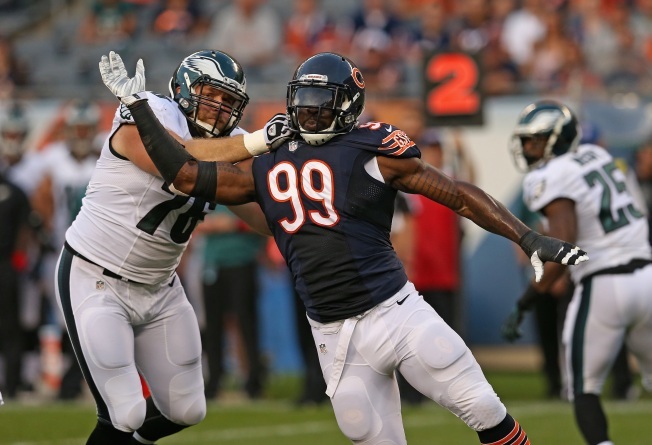 Bears DE Lamarr Houston tore his ACL and is out for the year. Houston, who signed a free agent deal with the Bears in the offseason, was hoping to be an effective run stopper with the Bears, and alongside Jared Allen he was hopeful that his pass rushing ability would come to the forefront as well. Instead, Houston will be known now as the guy who hurt himself celebrating a sack while his team was down by 25 points. Houston joins a select group of NFL players who have injured themselves while celebrating. Detroit Lions linebacker Stephen Tulloch is out for the year after tearing his ACL while celebrating a sack in a game earlier this season. Arizona Cardinals kicker Bill Gramatica also tore his ACL during a celebration after making a field goal in a game in 2001. While some fans are going to point to the fact that “karma” or some other outside force got even with Houston for celebrating in such a silly way at such an inappropriate time, there really is only one prism in which to look at this through: Houston’s injury hurts the Bears’ defense as a whole. Obviously he didn’t mean to tear his ACL when he went to celebrate that sack, but his showboating antics not only ended up ripping up his own knee, but they hurt the Bears’ defensive line depth at a time that they really could use all the help they could get in that area.